Avery Dennison fabric label printers are indispensable for the production and are designed specifically for printing on various textile materials. They're an excellent choice for cost-effective fabric label printing. Fast and reliable, these printers provide an affordable yet flexible solution for in-plant fabric label printing. 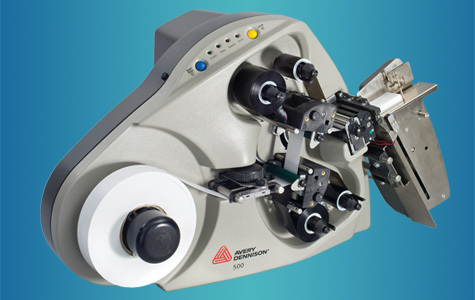 Avery Dennison's SNAP 500 printer is an excellent choice for cost-effective fabric label printing. 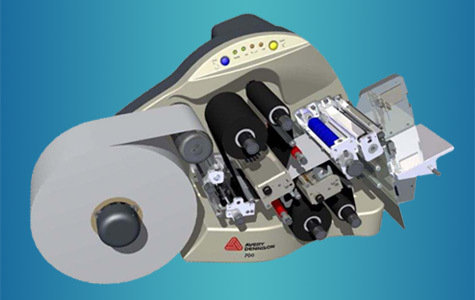 Fast and reliable, it provides an affordable yet flexible solution for in-plant fabric label printing up to 2" (51mm) wide. Its two-sided print capability maximizes fabric utilization, cutting costs. In addition, the machine is simple to set up and use and comes packed with innovative features. With high print speeds and an integral cutter and stacker, the SNAP 500 is highly productive: all your care and content labels can be printed, batched and stacked in a single operation. Read more... Avery Dennison's SNAP 700 is a multimedia thermal transfer printer that is easy to operate, reliable, and economical. You can use it to produce hang tags, price tickets, heat seal labels, pressure sensitive and price stickers, as well as care labels up to 5" wide. Avery Dennison's SNAP 700 features two-sided printing which allows you to create wide care labels, improving productivity and throughout. In addition, Avery Dennison's SNAP 700 offers a 5" wide print area, making it ideal for most hang tag, sticker, care label applications, and much more.